Park Ridge is one of Chicago’s older, inner suburbs, located about 15 miles northwest of the Loop. The name is descriptive of its park-like setting along a gentle ridge. Local legend to the contrary, it does not contain the highest point in Cook County. 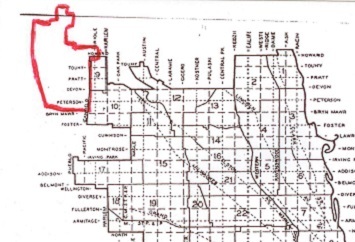 The area that became Park Ridge was originally part of a Potawatomi settlement. After the 1833 treaty, people from New England and upstate New York began moving in. They were mostly farmers. Reflecting their Yankee background, they called the district Maine Township. George Penny was a driving force in the early years. When the first railroad came through in 1854 he opened brickworks near the line, and then arranged to have trains stop by building his own station. The community was informally known as Pennyville, until Penny himself suggested it be called Brickton. By 1874 the brick pits had been worked out. The residents voted to incorporate that year, naming the new village Park Ridge. Over the next decades the community took on the look of a traditional New England town, with large homes on wide lots and plenty of trees. Apartments were banned and industry discouraged. The 1910 census counted 2,009 people in Park Ridge. Anticipating annexation pressure from Chicago, the village reorganized as the City of Park Ridge in 1910. The population continued to grow steadily, reaching 10,417 in 1930. With its pleasant surroundings and convenient Chicago & North Western rail service, Park Ridge had found its niche as a commuter suburb. The depression came, and building stopped. During the early 1940s and World War II, some new housing was constructed for war-industry workers. However, away from the main commuter station, much of Park Ridge was still open land. A new boom began with the war’s end in 1945. Americans were moving to the suburbs. They were looking for the good life away from the crowded central city. They wanted quality schools and their own ranch homes. Park Ridge satisfied all these desires. The population rose to 16.602 in 1950. Twenty years later it was 42,466. And once again, location was important to the growth of Park Ridge. In 1962 nearby O’Hare became Chicago’s chief airport. Meanwhile, the metropolitan network of express highways was under construction. The suburb was at a prime spot, near the junction of two major tollways and the Northwest (Kennedy) Expressway. The sleepy days were over. With the expanding population and demand for services, Park Ridge moved to increase its tax base by encouraging office-building. A small number of apartments and condominiums were allowed. However, a proposal by Marshall Field’s to build a store in Uptown was rejected, and commercial development remains limited. New residential construction has continued, even though the community has reached maturity. Beginning in the 1980s speculators started buying small houses, tearing them down, and replacing them with larger dwellings. The “McMansions” caused some controversy. Still, it’s acknowledged that they’ve helped keep general property values high. Park Ridge retains a feel of uncluttered openness. The Cook County forest preserves along the Des Plaines River are just to the west. And the suburb even has a pair of its own man-made lakes. If Park Ridge has a signature building, it’s probably the Pickwick Theatre. The landmark structure has been in place at the summit of Uptown since 1929, and was used in the credits of the Siskel-Ebert TV show “At the Movies.” Another art-deco gem from the same era is Maine East High School. Hillary Rodham Clinton’s girlhood home still stands on Wisner Avenue, a few blocks from the house where actor Harrison Ford grew up. The latest census reported that Park Ridge has a population of 37,480. About 93 percent of the residents are identified as white, with the remainder mostly Asian or Hispanic.